Stop by the corner of 41st St. and 8th Avenue in Manhattan from now till early May and you might spy a regal figure holding court in what was once an empty retail space. 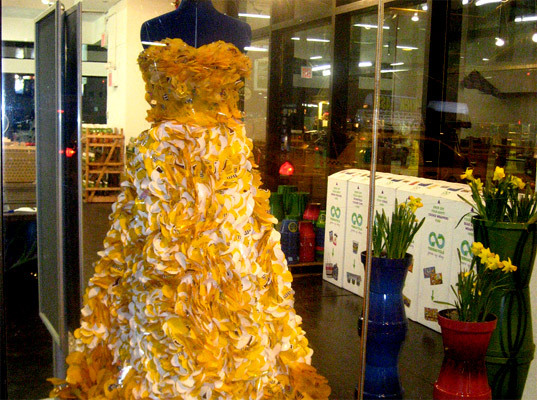 No longer vacant, Blank SL8 at the Port Authority Bus Terminal now hosts TerraCycle’s Green Up Shop—a short-term showcase for the company’s upcycled products—as well as a life-size gown stitched from discarded candy wrappers. More than 1,800 flowers were individually cut and sewn from 600 Peanut M&M wrappers. Liedtke’s wearable artwork depicts flowers in bloom: The top of the dress displays the initial budding, while the middle portrays a “landscape of blooming vibrant poppies,” according to the designer. 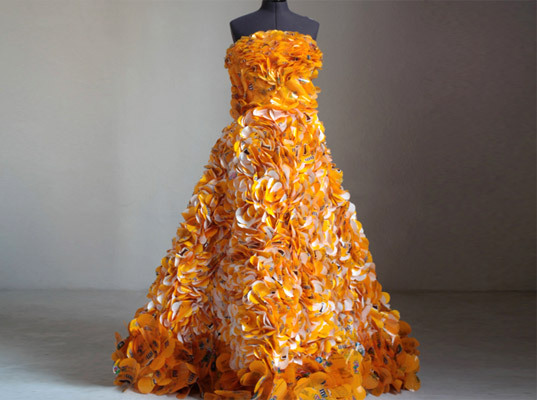 “Finally, the bottom of the dress expresses a collage of fully bloomed mature flowers,” she adds. i'd love to see the First Lady in this.